The 2+1 warranty, starting from the date of purchase, applies for all Mirka sanders, dust extractors and polishers. The prerequisite for this +1 year warranty extension is that the tool has to be registered on a Mirka website within 30 days from purchase. Warranty certificates are machine and customer dependent; each tool must be registered separately. Registration and additional warranty cannot be transferred to another person or company. If a problem occurs with a Mirka tool caused by a manufacturing defect material or by workmanship; Mirka will repair your tool free of charge in accordance with the warranty terms. 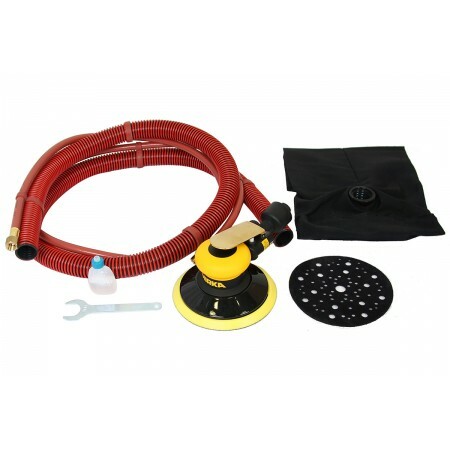 MIRKA¨ ROS 625/650 DB (Dust Bag) is a Pneumatic Random Orbital Sander with a 2.5 or 5.0 orbit. This sander is equipped with a dustbag, so there is no need for a central vacuum system, only compressed air is needed for dust-free sanding. This machine is developed for general sanding purposes on all kind of surfaces. This product is supplied in a cardboard box.